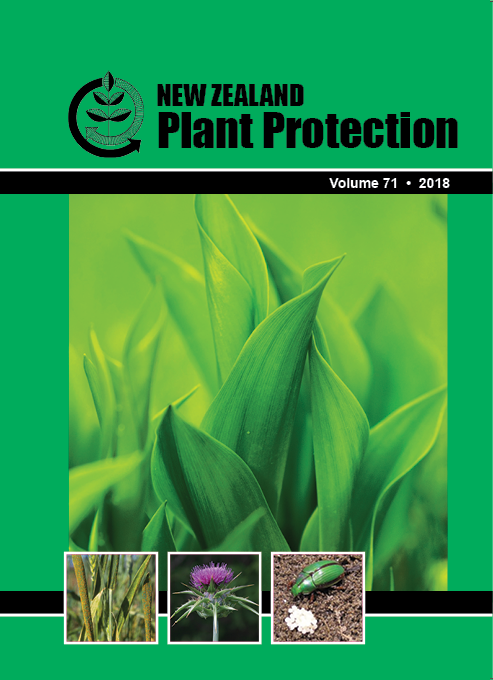 George Mason, one of the founders of Taranaki Nuchem (now Zelam Limited), in memory of Dan Watkins and to recognise his contribution to weed science within New Zealand. David Kerr, recipient of the 2017/18 Dan Watkins Scholarship in Weed Science, is an MSc student at Canterbury University. His thesis is on the reproduction and ecology of Mimulus guttatus DC, a persistent riparian weed imported from the western United States into New Zealand as an ornamental plant. This weed grows vigorously from the smallest fragments and has potential to cause major damage to river systems; crowding out natives and increasing flooding potential. David’s research aims to investigate how reproductive strategy facilitates the spread of M. guttatus, particularly the role of seed banks in establishing populations after habitat disturbance. Mimulus guttatus produces abundant seeds of very small size (approx. 500 Âµm in diameter), which have been demonstrated to be viable after travelling hundreds of metres downstream or dispersing in large numbers by wind from dry seed pods. Traditional management techniques involve mechanical clearance or use of herbicides in aï¬€ected rivers adjoining pasture land. These approaches have notable negative consequences, including waterway contamination and facilitation of fragment dispersal and growth. The first part of David’s thesis involved a survey of 250 contiguous 50-m long stretches of river at six valley locations around Banks Peninsula; recording the presence of M. guttatus and abundance as well as site data such as shading and evidence of grazing on M. guttatus plants. The data from this survey indicated a trend towards greater abundance in more open areas and occasional patches in more shaded regions where the canopy allows suï¬ƒcient light to grow. Previous work has identified a lack of understanding of transient overwintering seed banks. The second part of David’s thesis will investigate the hypothesis that persistent seed banks allow M. guttatus to establish upstream of populations in shaded areas when the canopy is disturbed. Mimulus guttatus in its native range has high fitness costs associated with selfing. The third will investigate the reproductive strategy of M. guttatus with reference to rates of selfing, and seed viability to test the hypothesis that historic pollinator and mate limitation have driven a change towards selfing. This work will further the understanding of the reproductive strategy of M. guttatus and how it invades river systems and inform land-management and conservation decisions. This has particular relevance to the role of sustainable ecosystem-level approaches to weed management such as native shade belts and conservation of existing forest around waterways to prevent weed establishment.